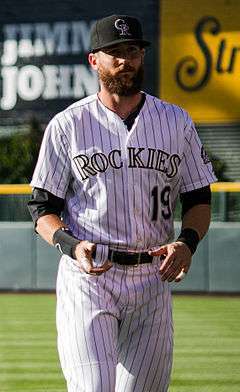 Charles Cobb Blackmon (born July 1, 1986) is an American professional baseball center fielder for the Colorado Rockies of Major League Baseball (MLB). Born in Dallas, Texas and raised in Suwanee, Georgia, Blackmon was an outstanding baseball player at North Gwinnett High School, as a left-handed pitcher and outfielder. Aside from baseball, Blackmon also competed in basketball and football, and was named Academic Player of the Year three times. After spending two years at Young Harris College, Blackmon received a scholarship to Georgia Tech, and transferred in the fall of 2006. At Young Harris, Blackmon won 15 games and had 138 strikeouts in 127 innings for the school, and was drafted for the first time after his freshman season. Blackmon had been recruited by Georgia Tech after his freshman season, but returned to Young Harris for his sophomore season as he had promised the team he would play for two seasons. Blackmon continued to pitch until his fourth and final year at Georgia Tech, after redshirting due to elbow tendinitis. As a fourth-year junior outfielder for Georgia Tech, Blackmon hit .396, hit eight home runs, and stole 25 bases as the leadoff hitter for the team. Blackmon also excelled academically, receiving various honors including being named to the 2008 ESPN The Magazine Academic All-America Second Team. He graduated from Georgia Tech in 2011 with a bachelor's degree in finance. Blackmon was drafted by the Colorado Rockies in the second round of the 2008 Major League Baseball draft. Blackmon had first been drafted in the 28th round in the 2004 draft by the Florida Marlins as a pitcher, and was also drafted in the 2005 draft in the 20th round by the Boston Red Sox. He spent 2008 with the Tri-City Dust Devils, hitting .338 in 68 games. In 2009, he was promoted to the Modesto Nuts, and hit .307 with 30 stolen bases in 133 games there. In 2010, he played for the Tulsa Drillers, and spent the first half of 2011 with the Colorado Springs Sky Sox. He was called up to the majors for the first time on June 7, 2011. He recorded his first MLB hit on June 8 at Petco Park against Dustin Moseley of the San Diego Padres with a 1-out single to right. He recorded his first MLB RBI on June 11 against Matt Guerrier of the Los Angeles Dodgers, driving in Seth Smith with a 1-out single. He recorded his first MLB home run on July 1, 2011, (his 25th birthday) in a pinch hit at bat against Joakim Soria. On April 4, 2014, Blackmon notched six hits—including three doubles and a homer—scored four runs and tallied five RBI out of the leadoff spot. He joins Ty Cobb (5/5/1925), Jimmie Foxx (7/10/1932), Edgardo Alfonzo (8/30/1999), and Shawn Green (5/23/2002) as the only players in MLB history to have 6 hits, 5 RBIs, and 4 extra base hits in a single game. Blackmon was named to the roster as a reserve for the 2014 Major League Baseball All-Star Game, the first selection of his career. On April 14, 2016, the Rockies placed Blackmon on the disabled list with turf toe. For the week of June 20, 2016, Blackmon was named the NL Player of the week by MLB. At the conclusion of the 2016 regular season, Blackmon was awarded a Silver Slugger Award for the first time in his career. Blackmon grew up as a fan of the Atlanta Braves. Blackmon's father, Myron, was a track and field athlete at Georgia Tech. In 2016, Denver 7 reported that Blackmon, despite his Major League salary, drove the same 2004 Jeep Grand Cherokee to spring training everyday that he drove to school every morning as a high school senior. ↑ Harding, Thomas (July 6, 2014). "Troy Tulowitzki, Charlie Blackmon to represent Rockies at All-Star Game". MLB.com. Major League Baseball. Retrieved 7 June 2016. ↑ Heaney, Tim (14 April 2016). "Rockies outfielder Charlie Blackmon's turf toe kicks him to DL". USA Today. Retrieved 7 June 2016. ↑ Andersen, Arran (15 March 2016). "Rockies outfielder Charlie Blackmon can't say goodbye to his pride and joy". Denver 7. Retrieved 7 June 2016. Wikimedia Commons has media related to Charlie Blackmon.